If the price of a new car still sounds like a lot of money to spend on a coffee shop, it's not. A few blocks from Beit lies the 3,500-square-foot Colombian roastery-café Devocion, which cost $1.2 million to build and opened in 2014. The coffee world is as gadget-obsessed as any industry you'll find: Baristas talk of dialing in their grind and dosing their shots. Depending on what flavor profile they're seeking and factors like the humidity in the air and water temperature, they will tweak a shot's extraction time down to the second. Espresso machines are gleaming works of cutting-edge engineering, with names that conjure up exotic sports cars -- and prices to match. La Marzocco's Linea PB, marketed as a modern take on its classic machine, can retail for upward of $15,000. A new Victoria Arduino Black Eagle will run you at least $20,000. Slayer, the U.S.-based company that makes many baristas' current fetish objects, charges $22,000 for its top-of-the-line machine. But when Café Beit, a new Williamsburg shop, opened on Bedford Avenue last month with its own La Marzocco, the three baristas behind it had spent just $25,000 to build out the entire shop. In fact, small coffee shops have become serious business during the so-called "third wave" movement -- a catchall term that, broadly, describes shops and roasters committed to treating coffee beans like an ingredient instead of a commodity. Industry titans like Stumptown, Intelligentsia, and La Colombe are in an arms race, rolling out innovations and new, gleaming shops all over the world in an effort to convince the masses that there are better things to be had than Starbucks, aiming to make terms like "single-origin and "pour-over" as ubiquitous as "latte" or "Frappuccino." Oakland-based Blue Bottle is a Silicon Valley darling that has raised over $100 million in investment capital in recent years, and in 2015 the holding company that already owned the Peet's Coffee chain purchased both Stumptown (for $130 million) and Intelligentsia (which was reportedly asking around $100 million) to expedite each company's growth. That means two of the biggest names of the "third wave" crusade are now part of the same conglomerate (JAB Holding Company) that is behind Caribou Coffee and K-Cups, as well as footwear and fashion brands Bally and Jimmy Choo. 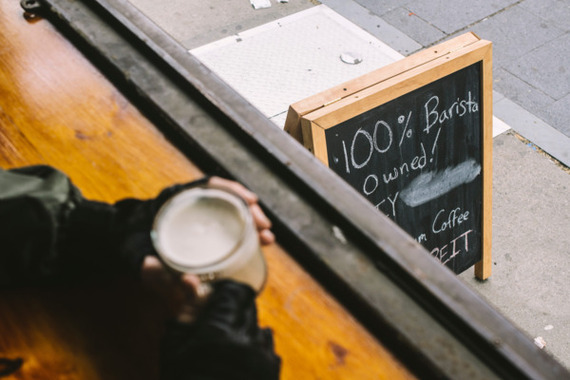 That's not to say every new coffee shop costs hundreds of thousands of dollars, but for independent owners looking to open a new shop, the capital required can still seem daunting. 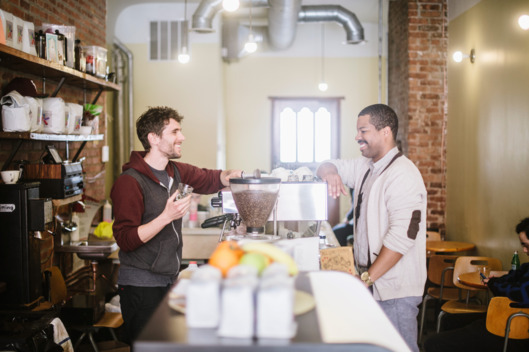 Even getting $50,000 together was something of a problem for 24-year-old Chris Miller, Jon Reagan, 29, and Pat Curry, 30, three baristas who decided to take over the Williamsburg shop where they worked, El Beit, and turn it into their own store. "It was going to look impossible," Miller says, so the group actually avoided crunching the numbers at the beginning. "Luckily, we were inexperienced and naïve enough to think it could work." In fact, they figured their plan wouldn't even work. When their boss, and El Beit's owner, decided last November to close the store, Miller, Reagan, and Curry figured they'd lose out to deep-pocketed potential tenants like the high-end fashion boutiques that were flooding the landlord with text messages. That's because the shop is on Bedford Avenue, one of the most-sought-after strips of retail real estate in the whole city, if not the entire country. The group thought they might lose the space to a high-end eyeglass store, and almost did lose it to a separate coffee-shop owner. But in the end, the landlord, who was a regular customer at El Beit, eventually came back around to the three guys she already knew. But the guys had to get the money together: three months of rent and $25,000, which industry vets say is about half as much as the group actually needed. Steve Sutton, the owner of Devocion, maintains that in New York it usually costs at least $50,000 to build a small, independent shop on the cheap. Building out a 1,000-square-foot space can easily cost half a million dollars. He was shocked when he learned how much Miller, Reagan, and Curry paid. For $25,000, Sutton says, he'd expect only a 100-square-foot space in perfect condition, stocked with used equipment. But Café Beit is 600 square feet with a large outdoor patio (which the new owners plan to use for open mics and music events). There will always be people who want to strip away any trappings they might see as superfluous (and at around $10,000 per month, rent is not exactly cheap), but the team's DIY approach is nevertheless impressive. The bones of the space are solid, and the group didn't need any work permits. Miller led the construction himself, gutting the space, unsealing and resealing the concrete floor, installing a new bar with wood salvaged from construction sites, crafting cabinets, and pouring concrete for the bar top. At the same time, Curry found out that equipment from the closed Café Edna in Greenpoint had been left behind, so the group bought a Marzocco Linea for only $2,500 from Café Edna's former landlord. They reopened on March 14, renaming the space Café Beit. Now they can focus on what matters: the coffee, which is as serious as you'd expect. A cup of drip coffee (bright and citrusy up front, with chocolate notes once it cools down) is single-origin from Colombia. The espresso is a 20 percent Indonesian and 80 percent Colombian blend. It comes from their friends at Spectrum Roasters, which has a scrappy start-up story that mirrors Beit's. And, in fact, that focus on both authenticity and sweat equity is something Beit's owners hope to turn into an asset. Miller, Reagan, and Curry -- who are, as of now, also the store's only employees -- are pushing the idea of a "100 percent barista-owned" shop, a term they promote on their store's signage and hope might catch on as a way of indicating which shops are the result of true elbow grease. "I think it's just a term no one's really used before," Reagan explains. "I haven't really heard of it." It might be the kind of thing that helps differentiate real local shops from sleek stores owned by international conglomerates, and a way for small owners to stay in the black as global companies continue to grab more of the coffee market.